Once the scorching heat of summer abates and fall arrives, locals and visitors from around the world descend upon the deserts of America. Cooler temperatures provide opportunity to explore the iconic lands of the West. The vastness of land in dry southwestern states like New Mexico and Arizona, and also California, means that there are plenty of opportunities to enjoy some time in the desert wilds. Here are some of the best places to go camping in the desert. The remote Chaco Culture National Historic Park, three hours from Albuquerque in northwest New Mexico, is well worth the bumpy ride in — its only access points are by 20-plus miles of gravel and dirt roads. Once you arrive, a paved, nine-mile loop from the visitor center accesses five of Chaco Culture’s major Chacoan sites, including the massive Pueblo Bonito ruins. These impressive, multi-story stone buildings, thought to have been gathering places for people of the southwest and as far away as Mexico, were built in the late 800s and are incredibly preserved. Four backcountry trails access different views of these ancient communities, as well as other sites and scenery. The park is also a designated International Dark Sky Park as it has very little light pollution and makes for spectacular night-sky viewing and photography. From April to October, campers can view the skies through the park’s observatory telescope. 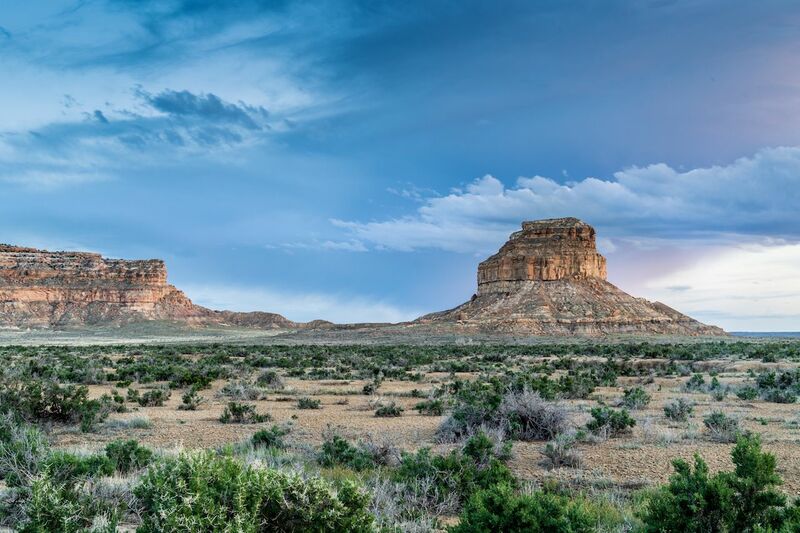 There are only 50 campsites at Chaco’s Gallo campground, so reservations are a must. Most sites here have a tent pad, fire pit with BBQ grate, and picnic table. You’ll find flush toilets and sinks in a central location to the tent camping but not much shade. Thankfully, drinking water is available at the nearby visitor center. 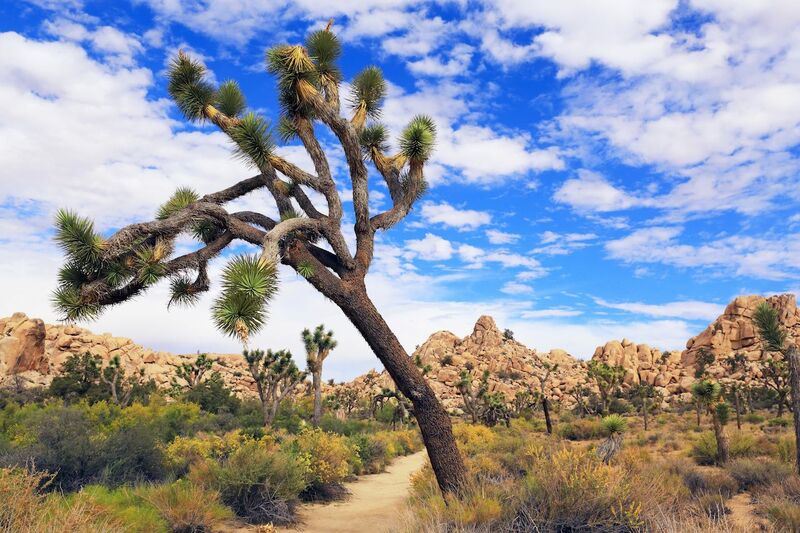 Thanks to its proximity to Los Angeles, just over two hours by car, it can feel like the whole world is visiting Joshua Tree, especially during its high season of October through May. For those with a little extra time and a camping schedule that allows for weekdays, you can escape the crowds that flood the park as temperatures begin to fall. The star of Joshua Tree is, of course, its namesake. This tree is actually a type of yucca plant, and many in the park are over 150 years old. Hiking, bouldering, rock climbing, mountain biking, photography, and stargazing are popular within the parks 790,000 acres. Of Joshua Tree’s nine developed campgrounds, two of the best are Jumbo Rocks, for night sky enthusiasts, and Cottonwood Campground, for hiking enthusiasts. Dispersed camping, or camping outside of an official campsite, is another option if you have the gear and expertise for it. It’s a great way to find some quiet in this busy, yet beautiful, spot. 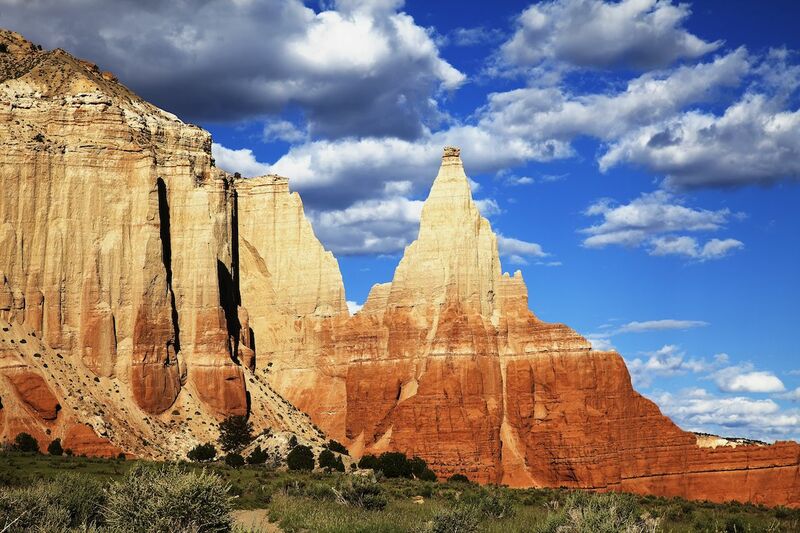 Located just over four hours from both Las Vegas and Salt Lake City, Kodachrome Basin State Park is a destination for photographers from around the world. In 1962, it was designated a state park but, fearing legal challenges from the Kodak film company, the name was changed to Chimney Rock State Park. But Kodak came through and allowed the original name to stick as it is an apt descriptor of the colors painting the area. The park’s sandstone spires, called sand pipes, sit atop multi-hued sandstone layers, telling the story of 180 million years of time. These sand pipes are believed to be found nowhere else on Earth. In addition to hiking, mountain biking, and horseback riding, stargazing is also popular. Another spot worth a visit is nearby Grosvenor Arch. Located just 10 miles southeast of the park, this double arch is one of the most impressive in the state. Kodachrome Basin has just over 50 campsites, ranging from tent to full RV hook up, including a group site and two bunkhouses. Modern bathrooms and a laundry facility make multi-day stays more comfortable. The Grand Canyon may be Arizona’s most flocked-to destination, but its accessibility from cities like Las Vegas means it’s crowded. Like, really crowded. If you want to camp somewhere stunning, without the tour buses, Monument Valley is a good option. Five hours from both Phoenix and Albuquerque, this park sits near Four Corners where Utah, Arizona, Colorado, and New Mexico meet. 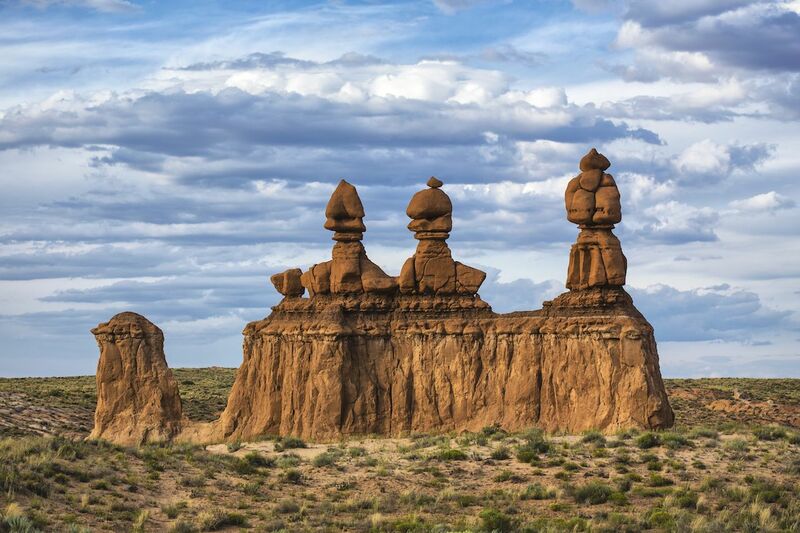 This cluster of vast sandstone buttes, featured in dozens of movies, are iconic images of the American southwest. Beyond a 3.5-mile official hike, visitors are required to access any other part of the area with a Navajo guide. This is absolutely necessary to enjoy other sights of the area, including popular Mystery Valley and Hunts Mesa. 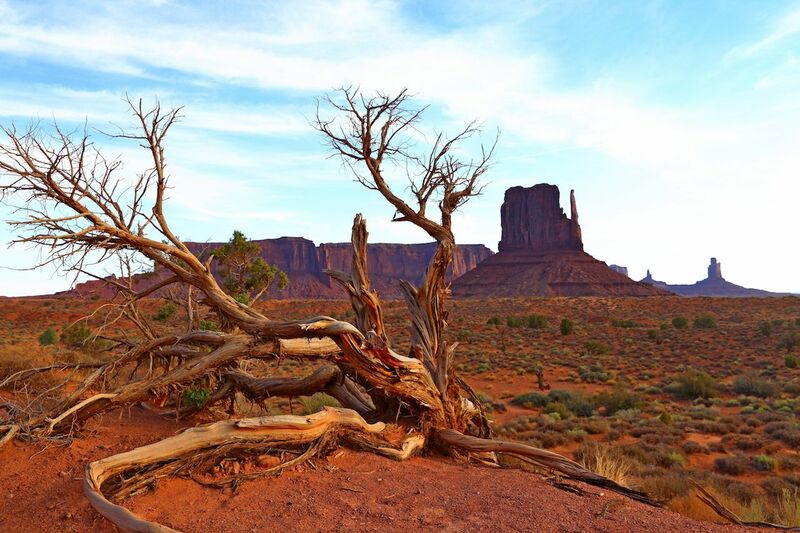 The View Campground overlooks Monument Valley and is a superb star-watching spot. You can stay here at a hotel, cabins, RV sites, or wilderness camping sites — depending on how monumentally “out there” you want to get. 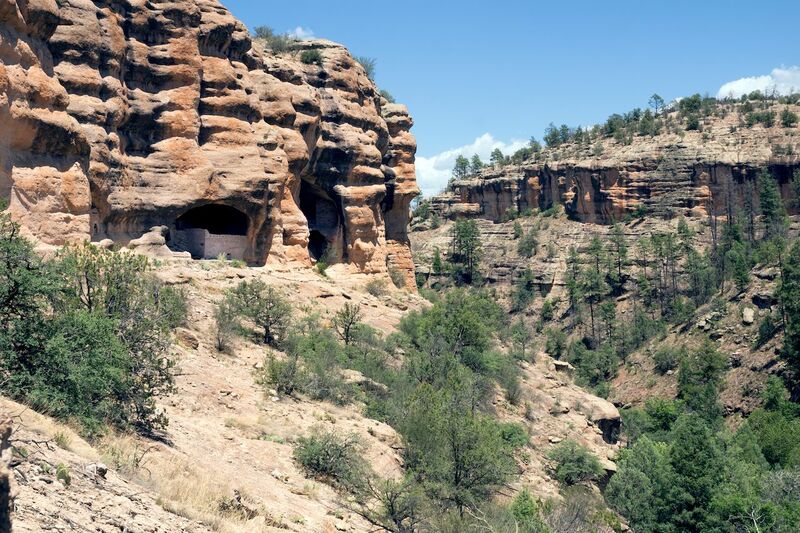 The Gila National Forest encompasses 2.7 million acres, a vast chunk of southwestern New Mexico. Within its bounds lie adventures for every high-desert camping enthusiast, thanks to its relatively moderate temperatures. (It does hit 100 degrees Fahrenheit in lower elevations over the summer, but higher elevations are cooler. Also, it snows in winter, but daytime winter temperatures are warmer). Popular activities include hiking, biking, backcountry horseback camping, and OHV (off-highway vehicle) outings. The forest has over 40 campgrounds, spread from the river and hot springs near the Gila Cliff Dwellings to the Cosmic Campground, the first international dark-skies observatory in North America. Those dark skies mean the area is very isolated, lying somewhere around five hours from either Albuquerque or Phoenix. But getting there is half the fun. Great stops along the way include El Malpais National Monument, Acoma Pueblo, and the Very Large Array telescope outside Albuquerque. 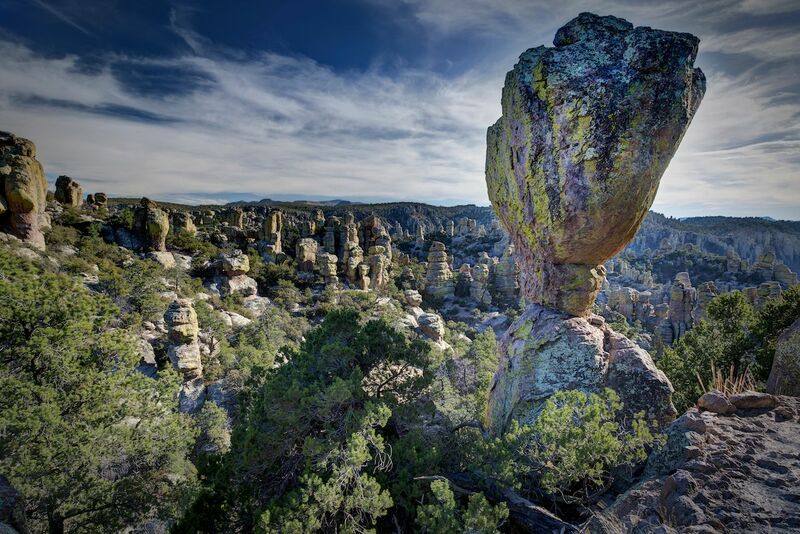 Chiricahua National Monument, only two hours east of Tucson, is a desert hiker and wildlife lover’s dream. The 12,000-acre “wonderland of rocks” has hoodoos and rock monoliths rising from the desert floor and an array of wildlife. At your campground, or on the 17 miles of hiking trails, you’re likely to encounter an incredible variety of birds, deer, skunks (just don’t make any sudden movements), coatimundi, cottontail bunnies, grey fox, and bats of more than 20 species. Black bear, mountain lions, and the endangered jaguar and ocelot also call the area home though you’re less likely to see them. Bonita Canyon Campground is a beautiful base to explore the riches of Chiricahua. Settled in the shade of a pine and oak forest, it has 25 semi-developed (no RV utility hookups) sites, as well as one group site. It has flush toilets but no showers. Thanks to the diverse wildlife, food storage lockers are available to all campers. Ok, maybe everything is bigger in Texas. Big Bend National Park is one of the largest and most remote national parks in the continental US. (The closest large city, El Paso, is a 5.5-hour drive away.) 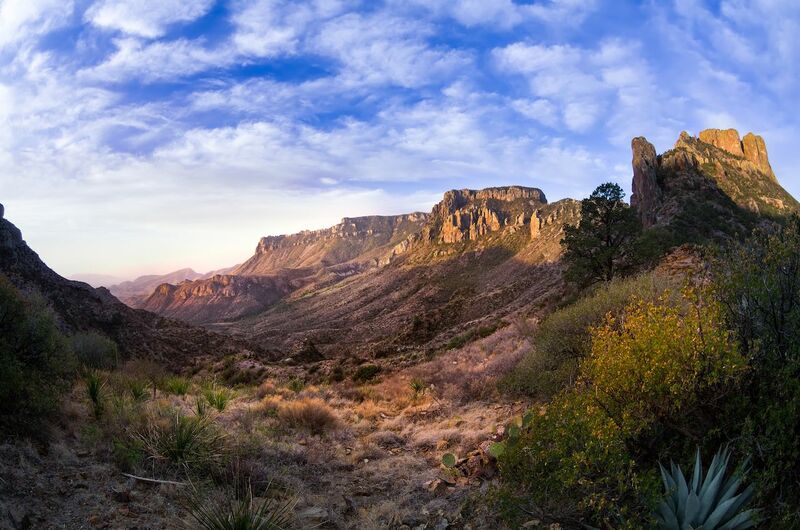 Big Bend also boasts more types of birds, bats, and cacti than any other national park. Lastly, it’s the largest protected area of Chihuahuan Desert topography in the US, protecting more than 1,200 species of plants, over 450 species of birds, 56 species of reptiles, and 75 types of mammals. It’s also one of the least-visited parks in the country. Fall and winter are ideal times to go — the weather can be cold, but it’s bearable compared to the triple digits of summer. The park encompasses an area of 801,163 acres, and its primary attractions are hiking and backcountry backpacking. Also popular are canoe and raft trips down the Rio Grande, of which the park administers 118 miles. Professional river outfitters can be hired, but the use of a personal boat is permitted with a free river float permit required. You can also cross the Rio Grande by rowboat to visit the village of Boquillas and enjoy hot enchiladas with a cold Mexican margarita. But be sure to bring your passport as border crossing stations lie on either side of the river. With over 200 campsites available, and a 14-night-consecutive-stay limit, you’re sure to have enough time to see almost everything this beautiful behemoth of a park has to offer. Goblin Valley is a little strange — but not in a spooky way. Goblins are actually the names of the sandstone rock formations that populate the park and make for some spectacular photos. Goblins are what remain of a vast inland ocean that deposited layers of mud, silt, and sand over 170 million years ago. Over time, erosion did its work on the softer parts of the rock, resulting in the ghoulish shapes here. Five miles of designated trails run through the park, but visitors are encouraged to wander off-trail and explore. Just outside Goblin Valley are slot canyons, petroglyphs, and OHV trails. This faraway spot, just over four hours from Salt Lake City, is very popular, so make a reservation if you want to snag one of the 24 camping sites or one of the two yurts the park has available. 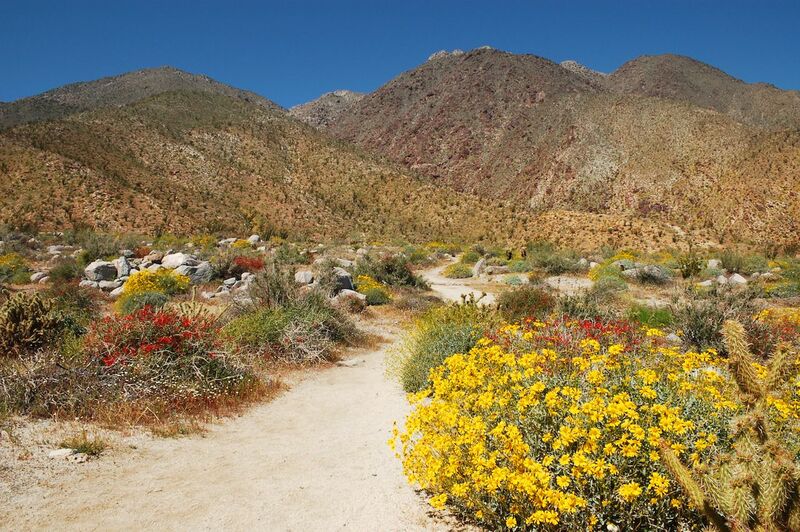 Three hours from Los Angeles, and only two from San Diego, Anza-Borrego is another park that gets a lot of traffic during the cool season. With more than 600,000 acres of desert adventure, you’re likely to find plenty of space for yourself if you get off the beaten path. Hiking and mountain biking are popular in the canyon washes and over the ridges of red desert rock. The formidable Pacific Crest Trail also runs through the park. After September 30, you can reserve camping sites in the park, which has 175 developed sites, eight primitive campgrounds, and plenty of options for dispersed camping. One of the more popular developed campgrounds is the Tamarisk Grove Campground, which opens for the season on October 1 and is close to hiking trails. The tall Tamarisk trees there, imported from the Middle East, offer plenty of shade from the sweltering desert sun.